Photos of the Field Day 2013 event have been posted on the club’s Google+ gallery page. Check them out and see what you missed. About every three hours a person or vehicle is hit by a train!!! Freight trains don’t travel at fixed times, and schedules for passenger trains change. Always expect a train at each highway-rail intersection. All train tracks are private property. Never walk on tracks; it’s illegal to trespass and highly dangerous. By the time a locomotive engineer sees a trespasser or vehicle on the tracks it’s too late. It takes the average freight train traveling at 55 mph more than a mile—the length of 18 football fields—to stop. Trains cannot stop quickly enough to avoid a collision. Field Day is this Saturday on June 22 – 23! We need some volunteers to help with the set up Saturday morning starting about 8:00 AM. We also need some volunteer hams to run the various stations. Pick a time and contact Jerry or Martha, their information is below. If you would also like to set up a station of your own, let us know. And, of course, we are looking for volunteers to help with the tear down on Sunday. We will have food during the day for everyone. If you would like to bring a covered dish or snack, it will be greatly appreciated by all the volunteers. Contact Jerry if you need more information. You can also contact Martha and she can try to find the answers. We hope you will bring your family and friends. There will be displays from the OEM, the National Guard’s MARS station, and hopefully something from the Davidson County Sheriff’s Department. We need your help and participation to make the NARC Field Day successful. Any time you can give will be appreciated. Forecasters with the National Oceanic and Atmospheric Administration (NOAA) are calling for an “active or extremely active” 2013 Atlantic hurricane season. In its initial outlook for the 2013 Atlantic hurricane season — which begins Saturday, June 1 and runs through November 30 — NOAA’s Climate Prediction Center (CPC) is forecasting a 70 percent likelihood of 13-20 named storms (winds of 39 miles per hour or higher), of which 7-11 could become hurricanes (winds of 74 miles per hour or higher), including 3 to 6 major hurricanes (Category 3, 4 or 5 with winds of 111 miles per hour or higher). These ranges are well above the seasonal average of 12 named storms, 6 hurricanes and 3 major hurricanes. A continuation of the atmospheric climate pattern, including a strong West African monsoon, that is responsible for the ongoing era of high activity for Atlantic hurricanes, which began in 1995. Warmer than average water temperatures in the tropical Atlantic Ocean and Caribbean Sea. On May 21 at approximately 9:40 PM EDT (0140 UTC on May 22), Logbook of The World (LoTW) — the ARRL’s online QSO confirmation system – reached a new record: 500 million QSOs. 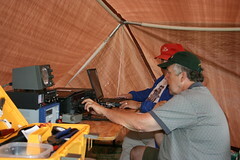 This milestone was reached as Gabor Horvath, VE7JH, of Crofton, British Columbia, uploaded a log from 2011 for VC7M, the Canadian Multi/Multi Team in the 2011 CQ WPX CW Contest. Last week, the ARRL announced that the introduction of the new (Trusted)QSL 1.14 software for Logbook of The World (LoTW) would be available on May 20. Upon further testing, three defects — now corrected — were reported after that announcement. Before publicly releasing a corrected version of TQSL 1.14, the software must be thoroughly retested by the Trusted QSL Software Development Team. LoTW users should expect a public release of TQSL 1.14 by the end of the month.